Peanut butter is a common food product used in households and as ingredient material in food industries. For common peanut butter cream, the producers of this product usually develop it to suit the consumer preference. Among the many physical parameters tested like: color, taste, texture; the spreadability of the peanut butter cream is one of the most important parameters as it gives the consumer the “correct feel” that this product is of good quality. Bad peanut butter creams are either too flowing or very difficult to spread. The optimum product has enough stability to remain semisolid in normal conditions, and flows in a paste like creamy structure when it is scooped and spread on a piece of bread. 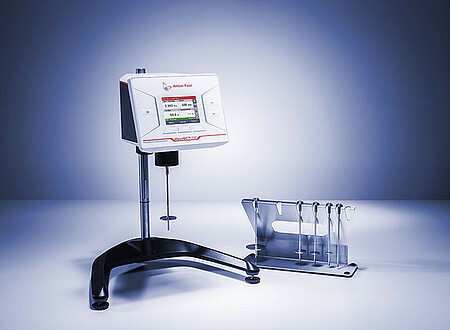 In order to characterize this property, R & D labs make various measurements using a rheometer like shown in Fig 1. After analyzing the effect of shearing on a peanut butter sample, the optimum viscosity is selected at a specific shear rate (corresponding to a specific rotational speed), and the method is developed and translated to be tested by QC department using a rotational viscometer. QC labs usually test the viscosity at a specific speed. And if temperature is a critical factor, the products are sometimes tested at a specific temperature for a fixed duration. Generally, in peanut butters, minimum sample disturbance is preferred in order not to change the structure of the butter, and therefore get a wrong viscosity reading. That is why care is taken not to disturb the sample structure by carefully scooping the sample into the container, and measuring at low speeds. 1. 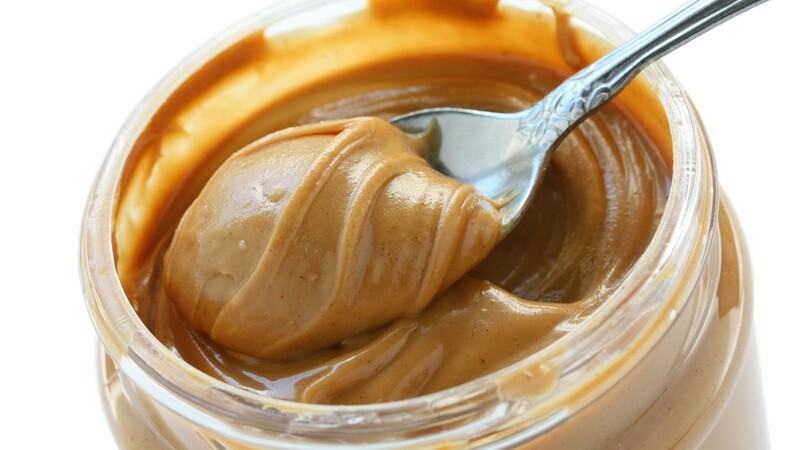 Peanut butter has high viscosity range, on average from 150,000 to 250,000 cPs. But depends on type of butter. 2. Peanut butter will exhibit shear thinning behavior, that is, its viscosity will decrease with increase in shear applied on sample. 3. Peanut butter is preferable measured at the lowest speed that can obtain an acceptable torque%. For this test, we selected 50% torque as a mid value. i. Amount of the sample was taken that can fill the beaker up to the 500 ml graduation. Care was taken not to disturb the sample structure while scooping to ensure the sample layers are uniformly stacked such as not to create any air gaps. ii. The RH6 spindle was inserted into the beaker and the apparatus centered under the viscometer. The spindle was attached to the viscometer via the magnet coupling and the instrument confirmed the spindle was inserted by a bleeping sound after which the spindle data is displayed on the screen. i. Peanut butter, as assumed, displays shear thinning behavior. When the speed in rpm was increased, the butter viscosity decreased. This corresponds to the case where a consumer will apply spreading force on a peanut butter to make it an a bread, therefore, the decrease in viscosity will allow it to be spreadable. ii. The measurement range obtained was 170,000 to 373,000 according to the speed. iii. At 50% approx. torque, the viscosity obtained was 252,000 cPs in a speed of 2 rpm. iv. When the speeds were continued until 12 rpm, the viscometer showed an out of range torque% (above 90%). In order to measure in further speeds, a higher range spindle like RH7 can be used. However, it is not advisable to go for high speed with this type of samples because the structure will be sheared extensively and will not recover as shown below. v. When speed of 12 rpm was reached, a measurement was done to a lower speed of 2 rpm and it was found that the viscosity dropped much lower than the original value of 252,000 cPs at the same speed. This indicated that the structure of the sample was disturbed and did not recover its viscous properties.